On going back to his homeland to understand just how radicalism takes root. When Talal Derki had made it to the Sundance Film Festival in 2013 with “Return to Homs,” which would go on to win the Grand Jury Prize for World Cinema Documentary, his mind was elsewhere. Based in Berlin these days, Derki made the difficult decision to head back to his home country to take an unparalleled look at radicalism from within, introducing himself as a war photographer to the leadership of the Al Qaeda group al-Nusra in Northern Syria and claiming sympathy to the jihadist cause in order to gain access. The group is extreme in their beliefs and actions, but what Derki does is not, simply observing the relationship between the al Nusra member Abu Osama and his eight sons, in particular the 13-year-old Osama and 12-year-old Ayman who are about to enlist in military camp. Allusions to the atrocities committed by Abu Osama and his peers come up in casual conversations, but relegated off-screen as what comes to the fore is how normalized violence has become in the war-torn region and how insidiously it is encouraged by one generation to pass on to the next. Although there’s no obvious judgment on the part of Derki’s camera, you come to realize how it’s meant to mirror the mindset of those it depicts, with women as absent in its view as they are likely considered by the men that are prone to abuse them and children musing freely about whether or not a teacher they had at school is still alive after their fathers have told them that type of education isn’t necessary. With the expectation that the audience will recognize a diseased way of thinking, the filmmaker presents something truly staggering simply by bearing witness, showing how mundane the influence of evil can be, from hearing propaganda music being sung in the car as if it’s Creedence Clearwater Revival or building up a tolerance to committing murder that starts with small animals and grows to human casualties. For such difficult subject matter, “Of Fathers and Sons” is both compelling and insightful in ways that few other reports from Syria have been and with the film now hitting theaters in America, we’re sharing this brief conversation we had with Derki just after the film’s premiere at Sundance this year, en route to recent nominations at both the Cinema Eye Honors and Spirit Awards for being one of the best documentaries of the year. It really is a remarkable film. I know you explain at the beginning of the film, but what was the decision like for you to return to Syria to make this? “Return to Homs” [tells] the story of the city and those people who want to fight for their country, and at the end of the film, you see [the characters I follow] in the dark, the first time you see them singing Jihadist song instead of revolutionary songs. They go on this dark path and most of the group, only one or two people survived. So I felt that bit of the footage was the first time that I meet the jihadists. I met ISIS. That was the first shock — I started to see these people speak about jihad in a positive way. As a secular person, [I realized] that things would not be as it should be and there would be more misery coming because every place jihadists came to, it’s become hell. And [wanted to make this] also because of my father because I was sitting with him and I started to think about others [will pass down to their children] because this generation will be damaged for a long period and I thought it’s only me who can do this film because I know lots of people and how to film in a war zone, so I thought it would be important now and for the future to be about the society from inside the perspective [of the jihadists], and I only need to present to the audience that the guys who are there [to depict] this barbarian situation. All the time was I was there, I was [in no position] to make any effect, except let the camera capture the moments I believed of importance in this project. The film is unblinking, but at the same time judiciously edited to leave out violence, though you have the implication of it. How did you go about what you wanted to present? The only violence you saw I think was cutting the head of the sheep, [which] tells about the father about his idea of sacrifice, [because] it makes the film more horrific if there’s no violence there. It’s more about the moment before the violence. [In another scene] when you see the young boy cry before they kill him in the prison, he cannot do anything before his life ends in this situation, and I think [seeing] this [moment] can reach people more [than witness] a shooting at his head. I cannot handle it [myself], but with this scene for example, I tried to bring what nobody [else] does because most of the time, with general shoots, [you hear] what jihadists believe, [and] I tried to show the misery on their face, how sad their eyes are, to go very deep into the psychology of the situation when [these men] are imprisoned in the hands of jihadists and that was for me the soul of the film I want to do. I kept in contact with the editor, and we worked the same on “Return to Homs,” [where] we talked a lot about the shooting and what should be the point of view. 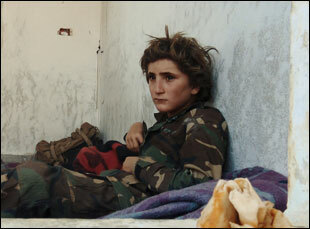 Before filming, did you have an idea that Abu Osama’s sons Ayman and Osama would be enlisting in the military camp? No. When I went there, there was a military camp, a small one [but] I start with everything [happening] in real time and I have to be there. It’s a difficult way of making documentary, but when you choose a special angle, you continue in one direction. Life is so huge, you cannot cover everything and this makes you feel weak [during shooting]. There’s no focus, there’s no specific drama you have to follow. We’d be there sometimes for two weeks without filming anything, just pretending to be a jihadist, praying with them and listening to these conversations which you don’t agree with — [in fact] all the time it’s against you and what you are believe, but you have to try to be quiet because this is the direction the film should take. It’s not about you. It’s about them. And it’s a not a dialogue. It’s their perspective. So [often] I’d return from the shooting to Europe and struggle to recover myself, totally broken. You can ask my wife — she’s the assistant director of the film and I used to call her, and she can tell you how it was totally difficult [it was for me] to handle, especially in between [separate shoots]. When I’m back, I think maybe I can get killed during this film and then I have to talk to her as a producer how [she] can continue the film if something bad happened to me or I get kidnapped and disappear, so for two-and-a-half to three years, I was a person without a soul in a way. I [knew I needed to] keep my patience strong, I should protect myself and my mind and I should film what makes this story [easily] understood [to] share this experience with a global audience. “Of Fathers and Sons” is now open in New York at the Museum of the Moving Image through November 22nd and opens in Los Angeles on November 23rd at the Laemmle Music Hall 3. DOC NYC '18 Interview: Molly Bernstein & Philip Dolin on Amping Up the History of Concert Promoters with "The Show's the Thing"